Jack "Legs" Diamond also known as Gentleman Jack, was the alias of Jack Moran, an Irish-American gangster based out of New York City. A bootlegger and close associate of gambler Arnold Rothstein, he survived a number of attempts on his life between 1919 and 1931, causing him to be known as the "clay pigeon of the underworld." In 1930, Diamond's nemesis Dutch Schultz remarked to his own gang, "Ain't there nobody what can shoot this guy so he don't bounce back?" Diamond entered crime as a member of a gang called the Hudson Dusters. In 1918-1919, he was jailed for being a US Army deserter. Hired by "Little Augie" Jacob Orgen to murder an enemy, Diamond became Augie's personal bodyguard. He was shot twice when Louis Buchalter, seeking to move in on the labor rackets that Orgen was running in the garment district, shot and killed Orgen. Diamond then went to work for Buchalter overseeing bootleg alcohol sales in downtown Manhattan. That brought him into conflict with Dutch Schultz, who planned to move beyond his base in Harlem. Diamond was shot five times on one occasion when Schultz's men surprised him at a private dinner and three times on another, when Schultz gunmen opened up with machine guns, killing two bystanders. On December 18, 1931, Diamond's enemies finally caught up with him, shooting him after he had passed out at a hideout on Dove Street in Albany, New York. The killers shot him three times in the back of the head at approximately 5:30 AM. In order for the Mafia to move in they had to have protection, and they know they'll never get it in this town. We settled that years ago. Legs Diamond...called up one day and said he wanted to go into the 'insurance' business here. He was going to sell strong-arm 'protection' to the merchants. I sent word to him that he wasn't going to do any business in Albany and we didn't expect to see him in town the next morning. He never started anything here. "Prior brought him around here...but he brought him around once too often. Fitzpatrick finished Legs." O'Connell added that Fitzpatrick (a Police sergeant and future chief) and Diamond were "sitting in the same room and (Fitzpatrick) followed him out. Fitzpatrick told him he'd kill him if he didn't keep going." Given the power that the O'Connell machine held in Albany and their determination to prevent organized crime from establishing itself in the city and threatening their monopoly of vice, most people accept this account of the story. In addition it has been confirmed by other former machine officials. Owney "The Killer" Madden was a leading Irish gangster in Manhattan during Prohibition. He also ran the famous Cotton Club and was a leading boxing promoter in the 1930s. Early life and the Gopher Gang. Born in Leeds, England to an Irish-born dockworker in 1892 and christened Owen Victor Madden, Owney Madden emigrated with his family to the United States in 1903. Settling in New York's Hell's Kitchen, Madden soon joined the Gopher Gang with his brother later that year. Described by associates as "that little banty rooster from hell", Madden quickly became a fierce fighter known for his skill with a lead pipe and gun in fights with rivals the Hudson Dusters. By 1910, at age eighteen, Madden had become a prominent member of the Gophers and was suspected in the deaths of five rival gang members. His reputation soon gained him leadership of one of the three factions of the Gophers. He was earning as much as $200 a day from the Gophers' criminal activities, such as the gang's protection racket which forced local businessmen to pay in the face of firebomb threats. During this time Madden enjoyed an opulent lifestyle and he was often accompanied by several women. However, he became known for his violent jealousy when he shot and killed a store clerk named William Henshaw who had asked out one of the girls often seen with Madden, while onboard a trolley. Henshaw initially survived the attack and was able to identify Madden as his assailant. When Henshaw later died of his wounds, police arrested Madden. Despite the attack having happened before dozens of people, the case had to be dismissed after no corroborating witnesses came forward. Over the next three years, the Gophers reached the height of their power as Madden recruited various gunmen into the gang. As Madden began encroaching into rivals' territory, particularly the Hudson Dusters, he was ambushed and shot eight times on November 6, 1912 outside of a 52nd Street dance hall by eleven members of the Dusters. Madden survived the attack, however, and refused to identify his attackers to police, stating "Nothing doing. The boys'll get 'em. It's nobody's business but mine who put these slugs in me !". Within a week of his release, six members of the Hudson Dusters had been killed. In 1914, Madden became involved in a dispute with Patsy Doyle, a prominent member of the Hudson Dusters, over a woman named Freda Horner. In a breach of gangland ethics (later known in Cosa Nostra-related circles as Omertà), Doyle informed police of Madden's operations. Following Doyle's assault on Madden's close friend Tony Romanello, Madden arranged for Doyle's murder. Madden relayed a message to Doyle through a friend of Freda Horner's named Margaret Everdeane to meet him , supposedly in order to reconcile. As Doyle arrived on November 28, 1914, Madden ambushed Doyle killing him. The police questioned Horner and Everdeane who both confessed to their role. Madden was eventually sentenced to twenty years at Sing Sing Prison. After serving nine years of his sentence, Madden was released on parole in 1923. The Gopher gang had broken up, and many members of his own faction were either in jail or working for bootlegging gangs. Madden initially became a strikebreaker for a New York taxi company but soon found work under Dutch Schultz in his fight against Jack "Legs" Diamond, Waxey Gordon, and Vincent "Mad Dog" Coll during the struggle to control New York City's bootleg liquor trade. He later opened the Cotton Club, formerly Jack Johnson's Club Deluxe, which became one of the city's most popular nightclubs. Madden also operated legitimate laundry and coal delivery businesses. With the support of Tammany Hall politician Jimmy Hines, he received considerable police protection. In 1931, shortly before the end of Prohibition, Madden left Shultz's organization and entered into partnership with boxing promoters "Broadway" Bill Duffy and George Jean "Big Frenchie" DeMange. Between them, they controlled the careers of the top five boxing champions including Rocky Marciano, Max Baer, and Primo Carnera. As Primo Carneras manager, Madden arranged fixed fights which led eventually to Carnera's winning the NBA World Heavyweight Championship in 1933. Carnera held onto the title for nearly a year, until suspicions from reporters about fixed fights led to Madden deserting the Italian strongman, setting up Carnera's famous defeat at the hands of Max Baer on June 14, 1934. In 1932, Madden was involved in the murder of Vincent Mad Dog Coll who had been extorting several mobsters including DeMange and Madden. After being arrested for a parole violation that same year, Madden began facing greater harassment from police, until he finally left New York in 1935. Leaving behind racketeering, Madden settled in Hot Springs, Arkansas where he opened the Hotel Arkansas, a spa and casino, in 1935. He also became involved in local criminal activities. The Hotel Arkansas became a popular hideout for mobsters; Charles Luciano was apprehended there in 1935. Madden became a naturalized US citizen in 1943, and eventually married the daughter of the city postmaster. He lived in Hot Springs until his death in 1964. At the time of his death he was said to have left $3 million in assets. With the industrialization of the United States and the emergence of labor unions in the late nineteenth century and into early 1900s street gangs began to be hired by companies as strikebreakers and to discourage union activity. Unions themselves would also hire labor sluggers primarily as protection from these strikebreakers and to recruit, by force if necessary, new union members. Many of these workers were recently arriving immigrants, particularly Jewish and Italians, in New York's East Side. Gangs made up of immigrants from similar backgrounds often sided with unions of their compatriots, but also were quick to exploit the lucrative opportunities for labor racketeering. By 1912 two major gangs, one led by "Dopey" Benny Fein and another by Joe "The Greaser" Rosenzweig, dominated labor slugging in New York. The various remaining gangs, who had been largely rendered powerless by Fein and Rosenzweig's brutal tactics, united in a loose alliance in an attempt to break the monopoly held by the two gang leaders. Declaring war, a major gunfight was fought on Grand and Forsyth Streets in late-1913 between Fein and Rosenzweig against several gangs, including Billy Lustig, Paul Phili, Little Rhody, Punk Madden (not to be confused with Prohibition gangster Owney Madden), and Moe Jewbach. While there were no casualties on either side, gang leader Paul Philip was later killed by Rosenzweig gunman Benny Snyder. Later arrested by police, Snyder confessed to the murder and agreed to testify against Rosenzweig, who also later testified against the gang. Although Fein and Rosenzweig defeated the gangs eventually, Rosenzweig's conviction in 1915, as well as Fein's arrest on a separate murder charge soon after, would see Fein also testify against his organization as an investigation was launched on labor slugging activities. Eleven gangsters and twenty-three union officials were arrested. The subsequent investigations and imprisonment of labor sluggers Benny Fein and Joseph Rosenzweig had effectively ended labor slugging and other labor-related racketeering until the release of "Kid Dropper" Nathan Kaplan and Johnny Spanish in 1917. Former rivals, Kaplan and Spanish formed a gang made up mostly of ex-Five Points Gang members that soon dominated labor slugging in New York virtually unchallenged. However infighting between Kaplan and Spanish began again, with Spanish leaving the gang in late 1918. The two factions began fighting for several months until Spanish was killed, supposedly by Kaplan, on July 29, 1919. With the death of Johnny Spanish, Kaplan completely controlled labor slugging operations for over four years. In the early 1920s, however, Kaplan began to face competition from rival Jacob Orgen's "Little Augies", including Jack Diamond, Louis Buchalter, and Gurrah Shapiro. In early 1923 war broke out between Kaplan and Orgen over striking "wet wash" laundry workers. Violent gunfights were fought throughout the city until Kaplan's death by Orgen gunman Louis Kushner while in police custody for a concealed weapons charge in August 1923. Orgen, now in complete control of labor racketeering, began expanding into bootlegging. However city officials began investigations into labor racketeering, putting pressure on labor slugging in particular. Advised by Meyer Lansky to instead infiltrate the unions, Orgen refused, continuing labor slugging operations. In October 1927 Organ was killed by former associates Buchalter and Shapiro, who also wounded Orgen's bodyguard Jack Diamond, in a drive-by shooting. As Buchalter took over as the principal labor racketeer in New York City he began to focus on control of labor unions and extortion, while offering his services to others in organized crime, eventually becoming head of Murder, Inc., as labor racketeering was divided among members into the National Crime Syndicate in the 1930s. 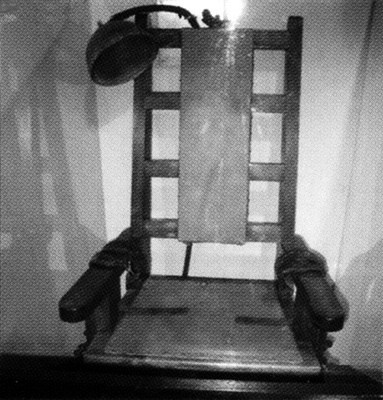 Sing Sing's chair was first put to use on July 7, 1891, when it executed 5 men for unconnected murders -- first Harris Alonzo Smiler, and then Shibaya Jugiro, James Slocum, Joseph Wood, and Martin Loppy. Its last execution -- also NYS' last execution -- took place August 15, 1963: Eddie Lee Mays. A total 614 men and women were executed by electric chair at Sing Sing. Louis Capone, Lepke Buchalter, Mendy Weiss died in the electric chair in Sing Sing Prison on the night of Saturday, 4 March 1944. Harry Strauss, Frank Abbandando, and Harry Maione were also electrocuted in Sing Sing. Whether or not he was actually guilty remains an open question. Yet his sinister ties with The Tenderloin underworld cannot be denied. . . . Becker had much against him: a blindly ambitious District Attorney who astutely saw a death sentence for Becker as a free pass to the Governor’s Mansion, a hostile press dedicated to the ruin of a corrupt police lieutenant, and a devil’s pact hatched in New York vilest prison, The Tombs, by three desperate killers eager to trade Becker’s life to save themselves from the electric chair. . . The original building that earned the name "The Tombs" for itself and succeeding jails on the same site in Lower Manhattan (Centre, Elm, Franklin and Leonard streets) was inspired by an ancient Egyptian mausoleum a travel writer described and drew in a book. The Tenderloin, the area now known as Times Square, which is centered at 42nd Street and Broadway, had hundreds of gambling casinos and was under siege by a virtual army of prostitutes. . . . It was common practice for pimps and casino owners to seek protection from prosecution by paying off the Police Department. On May 22, 1914, in the very first re-conviction in the city’s history, Becker again was found guilty of murder. . . . He was sentenced to die on July 16, 1914, and was taken back to Sing Sing. But again death would have to wait. More appeals were filed and the execution was postponed. In November of that same year, Whitman was elected governor of the state of New York. . . .